My mother made the best Coleslaw. 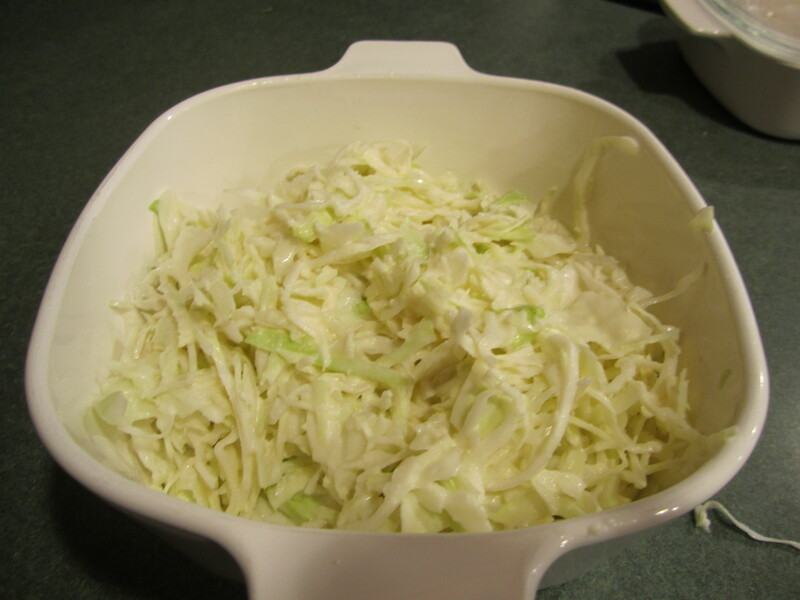 When she was still with us, I very rarely made Coleslaw because she made it so good. I just waited for a dinner occasion that required Coleslaw, invited my Mom and promptly asked her to bring the Coleslaw. Simple. It’s not that I didn’t have the recipe. I did. And on rare occasions I would make it. I just preferred it when my Mom made it. Maybe a month or two after my Mom passed, I decided I needed the Coleslaw. When I made it before, on those few occasions, I would grate the cabbage on this very risky slicer and mince the onion on a grater. Not fun. 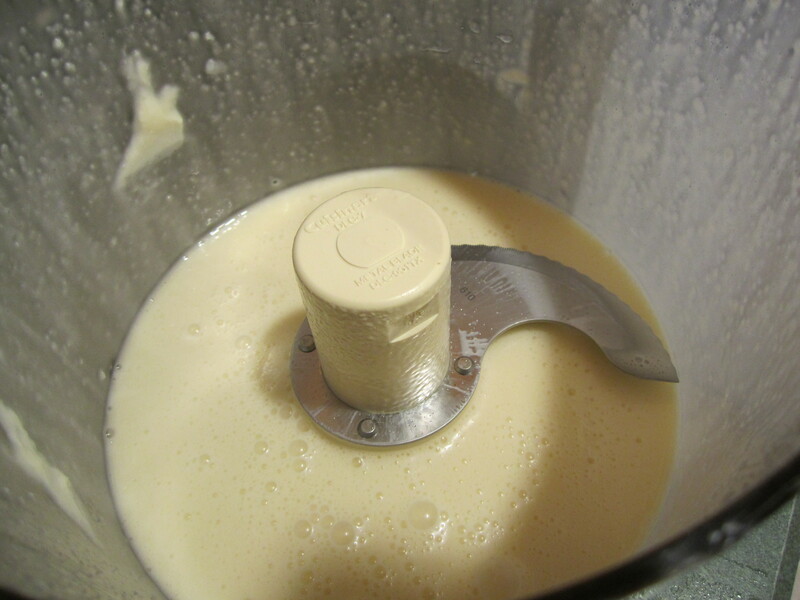 But when I made it this time, I remembered my mother had always used the Cuisinart. Then, it was like my Mom was speaking to me through this recipe, I kid you not, she told me exactly how to use the Cuisinart and how to make the whole process a cinch! 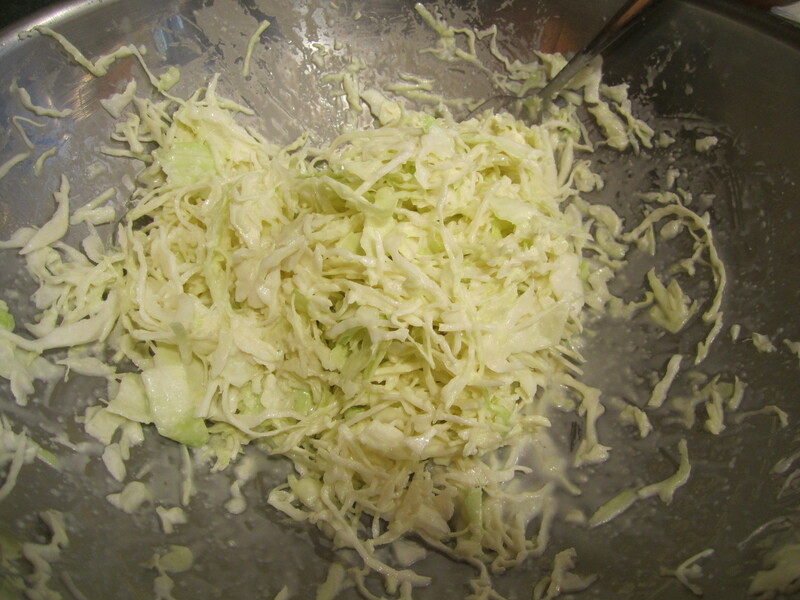 Cut up cabbage into eighths. Cut out core from each wedge. 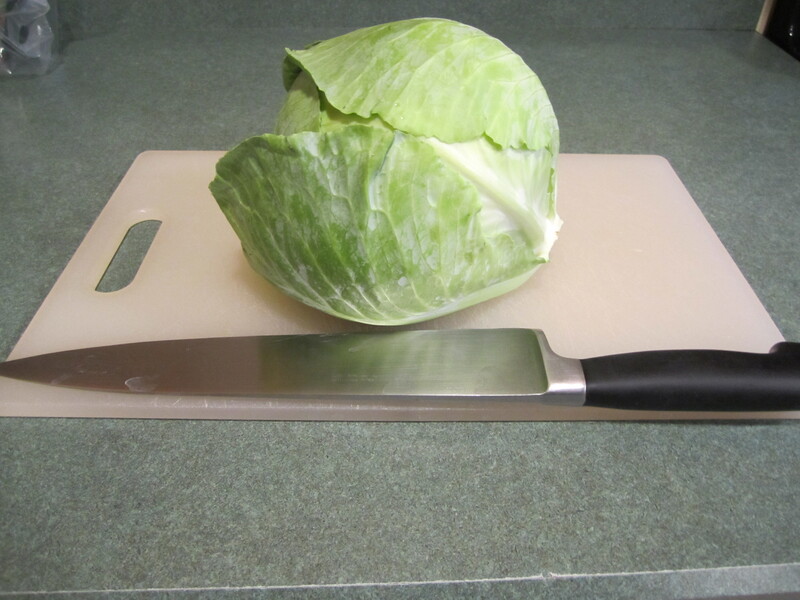 Using the Cuisinart 2 mm slicer, shred the cabbage. Remove any really large pieces and measure out ~ 4 -5 cups. Place cabbage in a large bowl. 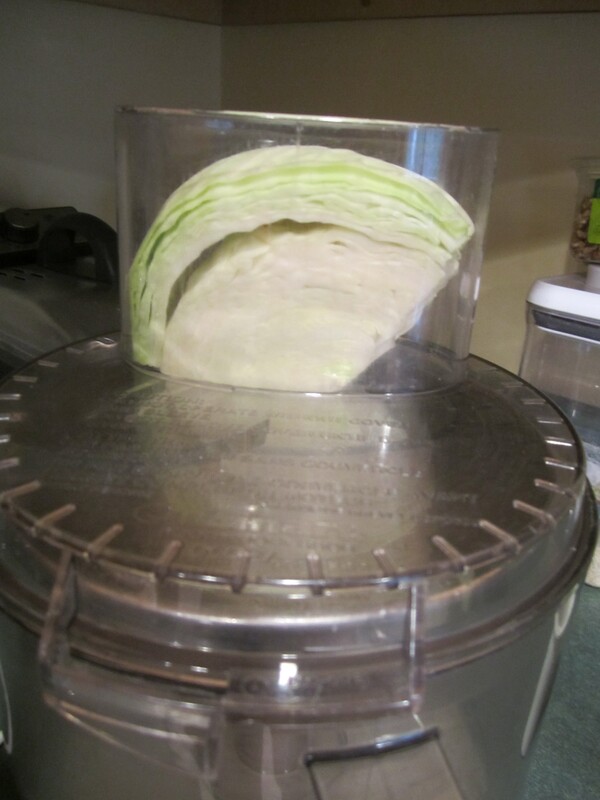 Clean out Cuisinart with your hands of any excess cabbage. Replace slicer with chopping/mixing blade. Put in Cuisinart bowl, the onion, mayonnaise, salt, sugar, cider vinegar and milk. Process until smooth. 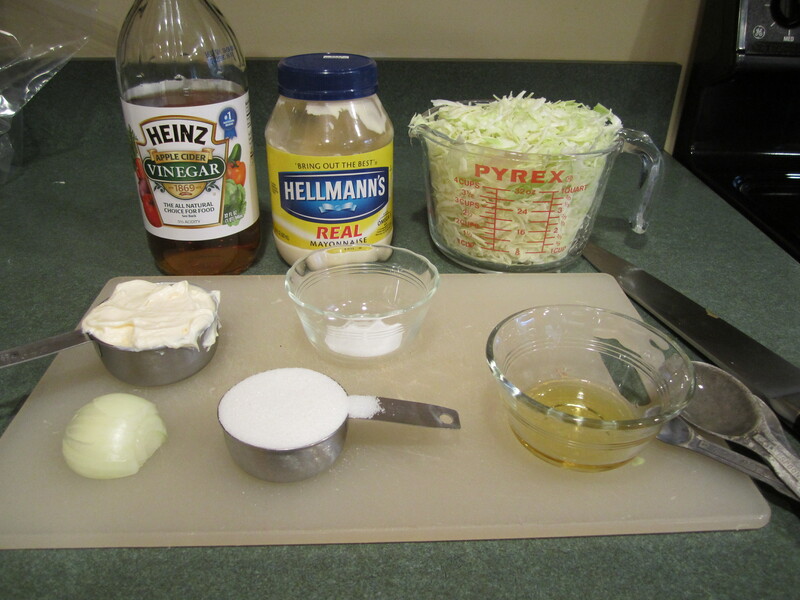 Pour dressing over cabbage and with a large serving fork, gently toss the cabbage with the dressing. Place in a glass dish, cover and refrigerate. I find it best not to make it more than a couple of hours before serving. This way the cabbage stays crunchy. But this is a personal preference. Always, always taste your coleslaw before you put it in the refrigerator. I made it one day and almost, just almost put it away before tasting. But I could hear my mother speaking to me in my head, “Taste the coleslaw, Sue!” So I did and you will not believe this but I had mistakenly put 1/3 cup of salt instead of sugar. Yikes, it was awful!!! My salt container had been on the shelf with the sugar (I usually always store them on separate shelving) and I inadvertently reached for the salt instead of the sugar! Needless to say, I dumped the whole thing out (that much salt would certainly make you pucker!) and went out to Shoprite for another cabbage. Learn, learn, learn from my mistakes! haha! 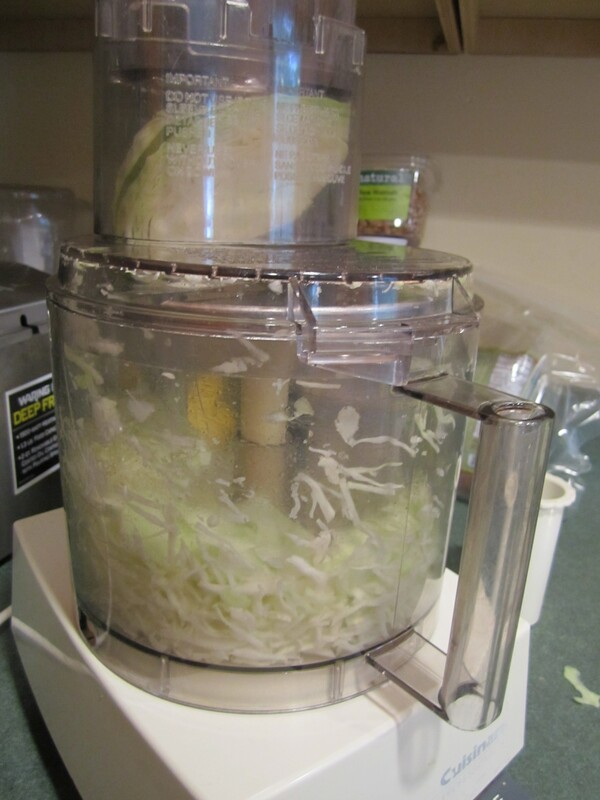 Just a side note: right after I made this batch of coleslaw I noticed that my Cuisinart was leaking, yikes. I started cleaning it and noticed the center cylinder inside the bowl had broken off. I really debated on getting a shiny brand new one (this one is at least 25 years old) but calmed down and bought a new bowl for only 25 bucks. Pretty cheap compared to a new $200 machine. But I said to my husband, I will not spend anymore money on parts. The next time something breaks on this machine, a new one I shall have!! Hi Susie – I enjoyed your grilling and coleslaw entries – planning on making grilled chicken with coleslaw tonight. Miss you! I need to get my act together to get together with you guys! Hope the summer has been terrific and everyone’s healthy, etc.! Hi Gail, oh good, yummy combo! Miss you too and would love to get together! We are all ok, going to LBI tomorrow with Sam. Sarah and Ian arriving Sunday. Much needed family time. Talk to you soon?